Balancing Chakras Part 2 - The Sacral Chakra - Amphora Aromatics Ltd – Supplier of pure essential oils and aromatherapy Products. Continuing our Blog series looking at how pure essential oils can help to balance chakras via massage or diffusion. Click to learn more. Our chakras consist of seven centres of life force energy, each of which play a part in the health of our mind, body and spirit. Location: Lower abdomen, 2 inches below the naval. Yoga pose: Child pose or Cobra pose. The issues affected by our sacral chakra include intimacy, emotions, sexuality, pleasure and creativity. Problems which may occur when this chakra is out of balance include PMS, menstrual problems, prostate problems, lower back pain or lack of sexual desire. Clary Sage – one of the most helpful essential oils for treating menstrual issues, including pain, missed periods and premenstrual tension. Clary Sage is thought to act as an all-round support for the female reproductive system. Women may find it particularly useful it to help energy flow smoothly throughout the monthly cycle. Ylang Ylang – as an essential oil it’s one of the most renowned aphrodisiacs. Ylang Ylang is a feel good oil which can help bring about feelings of emotional joy and happiness. A valuable oil to help overcome a lack of sexual desire due to its ability to release tension and calm the mind and body. Tangerine – The bright orange fruit is not only valuable in its food form for stimulating the sacral chakra. Tangerine in its essential oil form is valued for its ability to relieve stress and tension, balance emotions and promote feelings of joy. This can be especially useful if you are suffering from premenstrual stress. It is useful for treating fluid retention (the sacral chakra’s governing element is water so it’s vital to keep this in balance to maintain optimum health). Other essential oils you may like to use include Geranium, Rose, Bergamot and Jasmin. To use essential oils to stimulate the sacral chakra you can dilute them in a carrier oil (maximum 3% blend – 3 drops of essential oil per every 5mls of carrier oil) and apply to the sacral point (Lower abdomen, 2 inches below the naval) via massage. 3 drops Tangerine, 2 drops Clary Sage & 1 drop of Jasmin. 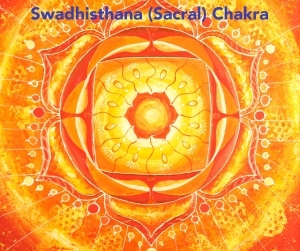 There’ll be another blog for you tomorrow as we continue our journey through the 7 chakras. Thank you for reading! Don't forget that you can take a look at all of our other blogs by clicking here.